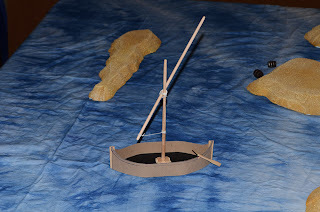 I'm working on a small sailboat for the Savage Worlds Hyboria Forgotten Islands campaign. It's a simple construction and should be suitable for a small party for island hopping purposes. I'll probably be making several boats of this size in addition to some larger ships. I'm pretty happy with the way this one turned out. I've done fancier ships in the past but I have a lot to build for this campaign and don't have the time to make really complicated models.